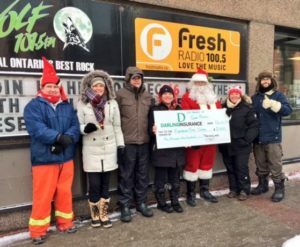 “The Loonies” and friends were back at the corner of King and George Streets in Peterborough on Friday December 16th, 2016, raising funds for Kawartha Food Share. Chilly morning temperatures kept volunteers dancing about, collecting donations and sharing seasonal cheer with motorists and passers-by. After every coin was counted, over $101,000 has been raised this year to help in the fight against hunger. “The Loonies” were represented by “Santa” Peter Blodgett of Darling Insurance, and Peter kept everyone entertained on local radio simulcasts generously hosted by Corus Radio’s The Wolf 101.5, 100.5 Fresh Radio and CHEX-TV, as well as iHeart Radio’s Energy 99.7 and My Broadcasting Corporation’s Oldies 96.7. The broadcast included performances by high school music and drama students, local musicians, as well as messages of support from the Police and Fire Departments and local dignitaries. Kawartha Food Share assists more than 8,100 men, women and children every month through 36 member agencies. In 2015, their warehouse distributed over $5 million worth of food and emergency care needs. They support daily nutrition programs at 51 area schools, four meal programs, four City food banks, seven County food banks, six housing projects and over 20 food cupboards across the City and County of Peterborough. For every $1 donated, Kawartha Food Share can purchase up to $6 worth of food; the donations received really do make a difference in our community. Peter Blodgett and Darling Insurance would like to thank the following valued industry partners for their generous support: Boiler Inspection & Insurance Co. of Canada; Economical Insurance; Gore Mutual Insurance Company; The Commonwell Mutual Insurance Group; and Wawanesa Mutual Insurance Company.